The congregation at Port Melbourne Uniting Church are a diverse group of people who live and work in and around the City of Port Phillip. Over the past few years there has been increasing interest amongst members of the congregation to look at their effect on creation and how they use resources. 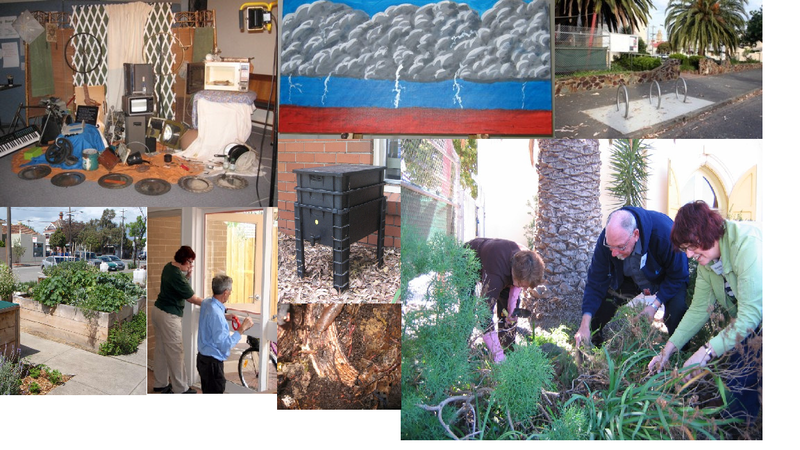 In July 2007 the congregation at Port Melbourne Uniting Church began an Eco Project, “Inner Urban Sustainability and Stewardship”. A generous donation provided seed funding for this project, allowing the congregation to employ a project worker, Janet Hoare, for five hours per week. A Task Group of congregation members chaired by Rev Peter Greenwood was formed to oversee the development of the project. The project was officially launched on the 24th of August 2007 with Janet Bolitho, mayor of the City of Port Phillip and Cath James, Environmental Officer at the Uniting Church in Australia Synod of Victoria and Tasmania as guest speakers. Guests inflated black balloons to symbolise our CO2 emissions and a hard rubbish sculpture was created. On the 18th of January 2009, Port Melbourne Uniting Church became the first institution in Australia to qualify for the Five Leaf Eco-Awards’ Basic Certificate, receiving the award from Five Leaf Founder and Church Project Coordinator, Jessica Morthorpe. In order to earn the Basic Certificate, the church installed window film for insulation; set up a community garden; installed bike racks so congregants can ride to church; created a worm farm to be shared with the kindergarten next door; switched to energy efficient lights; and turned off a rarely used fridge. They also included eco-friendly tips in our weekly news sheet and created a ‘Green Book’ to record and encourage actions by our congregation to reduce their impact. “We also conducted services with ecological themes, and we hosted a Winter Forum with the theme ‘Think Local, Act Local’. Four speakers who are actively involved in our local community gave presentations on topics including community food gardens, City of Port Phillip Community Climate Plan, the 7-Star house project in South Melbourne, and Locals Into Victoria‘s Environment (LIVE), based in Albert Park. Our Simply Living Community Garden has been a particular success, with members of the congregation bringing in clean shower water to water the garden during the drought, and the produce being provided to the poor in our area to assist them in improving their diets. The garden, which is at the side of our church and visible from the road, has also proved a valuable outreach tool, with members of the community approaching us to ask about the project. 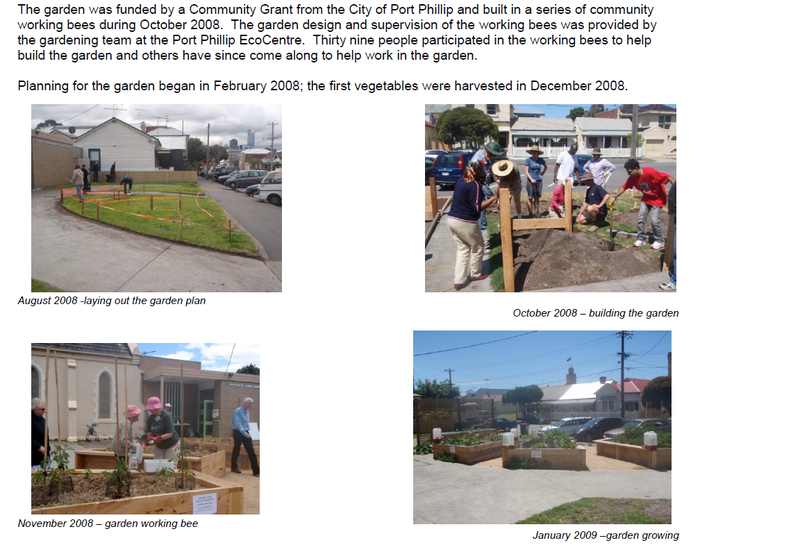 We even had members of the community we hadn’t met before drop in to give us a hand during working bees, adding to the success of the program,” said Janet Hoare, Port Melbourne Uniting Church Environmental Manager. “Within our congregation, people have really engaged with it, particularly our special project, which is a community veggie garden,” she said, “Really, none of the things we did were particularly difficult, so I would imagine that most churches would be able to do most of those things, if not all of them”. The church continues to hold an annual SkillsFest event and has many more exciting plans for the future.